Competition remains strong in the domestic market, especially among small and medium-sized machinery companies dependent on construction businesses. 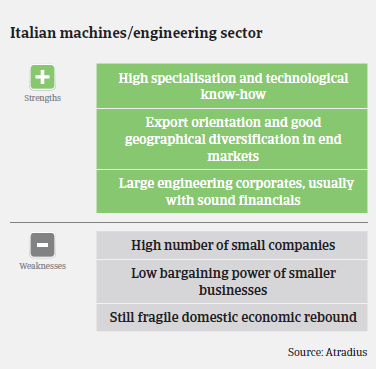 The Italian machines/engineering sector has proved to be relatively resilient during the downturn of Italy´s economic performance due to its export orientation, high specialisation and added value products in precision mechanics. Both specialisation and quality have helped to preserve satisfying profit margins for many (export-oriented) businesses. However, competition is strong in the domestic market, especially among small and medium-sized machinery companies dependent on construction businesses. The still slow domestic investment growth and the weakness of some end-markets suggest that in some subsectors mainly smaller machinery businesses remain impacted by lower production. 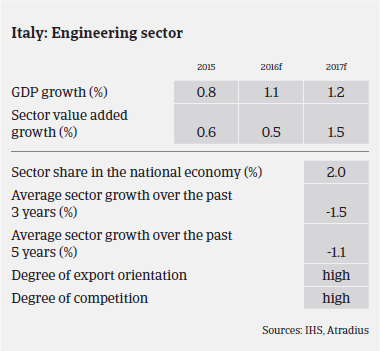 The construction and road machinery segment performance is still hampered by weak construction performance in Italy. The earthmoving machinery segment is highly dependent on public works and therefore exposed to structurally slow payments by public entities. At the same time, demand for machinery related to the oil and gas sector is deteriorating. In contrast, the machinery segment dependent on the manufacturing sector continues to benefit from export growth and from increased demand from the domestic market (e.g. automotive). Larger and more diversified machinery companies and export-oriented SMEs are expected to improve performance and cash generation. Payment duration in the Italian machinery sector is about 100 days on average. Payment experience has been good over the past two years, and the level of protracted payments is low. Non-payment notifications have decreased over the last 12 months, and are expected to decrease further in the coming months. The number of insolvencies in the machinery sector is relatively low. Machinery insolvencies have been stable over the past six months, and are expected to decrease in the coming six months. Our underwriting approach in 2016 remains generally open, especially for larger businesses and niche export-focused subsectors (e.g. high precision mechanical works). Those businesses usually show solid financials and a good liquidity profile. 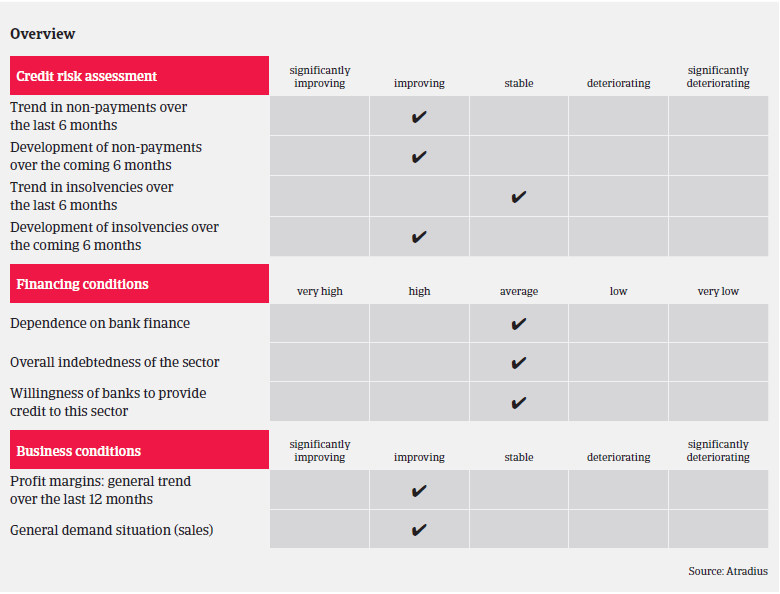 However, we are more cautious about companies operating in still difficult end-sectors (e.g. construction) and which are dependent on public entities. We closely monitor machinery businesses which produce components for the oil and gas sector, as investments in this industry have deteriorated due to lower energy prices. Due to late payment of commercial invoices, notably more respondents in Italy (41%) than in Western Europe (23.7%) delayed payments to their suppliers. Italy is expected to see only a modest insolvency decrease in 2016 after years of steady increases. This is in line with the modest economic rebound.